Most employees loath them; many managers avoid them. High Performance Organizations have them, and they do what they’re designed to do—evaluate precisely the performance of each employee. Feel like you don’t need them? Here are 10 great reasons that should change your mind. Most organization employees we meet with say they have no idea what the yearly top two or three goals are for their organization. A great performance program sets these goals as their starting point. Ninety-nine percent of employees in this country want to do well at work, but we lack leaders who know how to align their desire to achieve to the organizational goals. Many organizations are not transparent concerning how to be promoted. 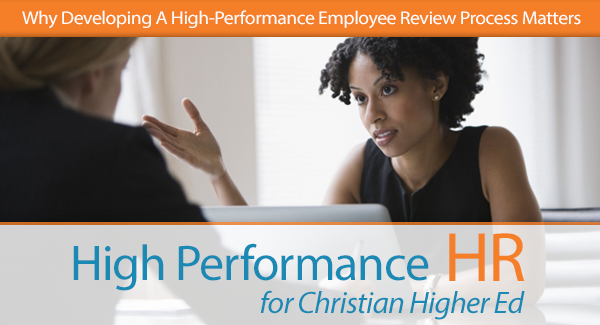 A performance review process more readily identifies those employees who deserve promotion and those who require lateral shift (transfer) or need to enter into a remedial program. This system also aids career planning. Most people really do want to be better at their jobs! Helping employees to identify their strengths and weaknesses and informing them of the organization’s expectations concerning their performance helps them to better understand the role they play and increases work efficiency. Feedback reinforces good performance and discourages poor performance. Instead of creating “programs of the month,” you can use performance review data to more accurately ascertain training needs and identify skills that need to be developed in order to tailor-make the most effective training and development programs. Performance management puts all employees on the same measuring tape. Identifying and removing factors responsible for worker discontent motivates them to perform better at work. Performance management helps to create a positive and healthy work environment in the organization. Relations between superiors and subordinates can be improved through the realization that there exists a mutual dependence that leads to better performance and success. By facilitating employees to perform introspection, self-evaluation and goal setting, their behavior can be modified. Better interpersonal relationships lead to team building. Performance management can help to develop fairer and more equitable base lines for reward allocation, wage fixation, raises, incentives, etc. A performance review process provides a means to exercise control of projects focused on, and helps keep employees aligned to the agreed upon annual goals and objectives. Performance management serves as a mechanism for improved communication between superiors and subordinates. Often times managers shy away from counseling employees. When the right system is in place, especially is it is employee driven, it forces discussions on a regular basis. In closing, my experiences lead me to support employee driven programs. Programs that rely on managers and leaders have a higher propensity for failure. Simple yet meaningful programs that include goals, objectives, behaviors, an employee development component and stretch assignments meet what most employees’ desire. How important are employee performance reviews in your organization? We would like to know. Please leave comments below.